A large pile of salt at an Uppington, South Africa, salt mine. NaCl, KCl, and Na 2 SO 4 ; acid salts like NaHCO 3 and NaH 2 PO 4 ; or double salts like KAl(SO 4 ) 2 . Table salt is sodium chloride, a chemical compound with the formula NaCl. Sodium chloride has been used to flavor and preserve food for thousands of years. As a result, salt became an essential part of commercial transactions and was often used as money or barter. Exchange of salt for slaves in ancient Greece gave rise to the expression "not worth his salt." The Romans gave a salarium (salary) to those who were "worth their salt," and Roman soldiers were given salt rations known as salaria argenta. Today, salt continues to be of major economic importance, with thousands of uses in addition to flavoring and preserving food. Sodium chloride forms colorless, cubic crystals that are made up of large numbers of NaCl formula units, to give a three-dimensional crystalline lattice in which each sodium ion is surrounded by six chloride ions and each chloride ion is surrounded by six sodium ions. The strong electrostatic attractions between the positive and negative ions, known as ionic bonds, hold the solid sodium chloride together. Sodium chloride occurs naturally as the mineral halite, commonly called rock salt, in large underground deposits on every continent. Seawater contains about 3.5 percent dissolved minerals, of which 2.8 percent is sodium chloride and the other 0.7 percent is primarily calcium, magnesium, and sulfate ions. Natural brines, or salty waters other than seawater, are found in wells and lakes, such as the Great Salt Lake of Utah and the Dead Sea. Salt is also found in surface deposits in regions subject to arid climates. 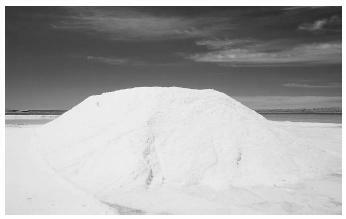 The manufacture and use of salt is one of the oldest chemical industries. The three main methods for recovering salt are: (1) underground salt mining, which uses techniques similar to those for mining coal; (2) solar evaporation of seawater or natural brine in lakes or large lagoons; and (3) evaporation of brines obtained by pumping water into a rock salt deposit, dissolving the salt, and bringing the brine to the surface. If the salt is going to be used for food flavoring or preservation, additional purification is required, usually by methods that use multi-stage evaporation of brine solutions. The annual world salt production is about 200 million tons (181,436,948 metrictons). The top producers are the United States and China with 45 million and 30 million tons (40,823,313 and 27,215,542 metric tons), respectively. Table salt is pure salt that has been ground into fine particles. Because salt tends to cake in humid climates, an anti-caking agent such as magnesium carbonate or calcium silicate is often added. Table salt is also available as iodized salt with 0.1 percent potassium iodide by weight. Because iodide ion is essential to thyroid gland function, the routine use of iodized salt ensures adequate iodine in the diet. Salt is used to cure meat and fish by soaking them in brine, rubbing salt onto them, or injecting them with a salt solution. Bacon and cured ham are examples of meats preserved by the use of salt. Salt is also used to make pickles by soaking cucumbers in brine. Rock salt is sprinkled on highways to melt ice. The lowest temperature at which salt can melt ice is −21°C (−6°F), at a concentration of 23 percent salt, and it works best when temperatures are at or slightly below freezing, 0°C (32°F). Salt is also one of the raw materials used in the Solvay process for manufacturing sodium carbonate (soda ash). Both sodium chloride and potassium chloride are essential to the electrolyte balance in body fluids. Good health depends on the proper ratio of potassium ions to sodium ions. Typical values are greater than one. Natural, unprocessed foods have high K + /Na + weight ratios. Fresh, leafy vegetables average a K + /Na + ratio of 35, and fresh, non-leafy vegetables and fruits average a ratio of 360, with extreme values of 3 for beets and 840 for bananas. After such foods are eaten, the body achieves K + /Na + ratios of greater than 12. However, during processing (and cooking, if foods are boiled), both potassium and sodium compounds are dissolved by the water used, which is then discarded. The sodium ions are replenished by the salting of the food, which gives it a lower K + /Na + weight ratio. One solution is to eat unprocessed, natural foods and to salt foods with a commercial product that contains both potassium and sodium chlorides called "Lite Salt." SEE ALSO Alkali Metals ; Chlorine ; Halogens ; Sodium . Kurlansky, Mark (2002). Salt: A World History. New York: Walker and Co.
Salt Institute. Information available from http://www.saltinstitute.org . Isn't NaHCO3 a basic salt? If I am not mistaken, it neutralizes acid. Date of publication? I'm thinking of using this article as a resource for a report.